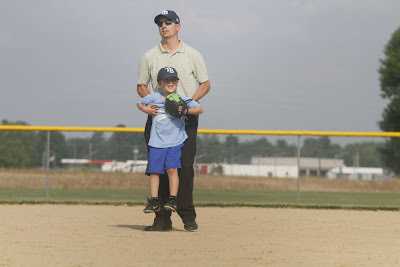 Jack's coach taking him off the pitching mound and returning him to 2nd base. 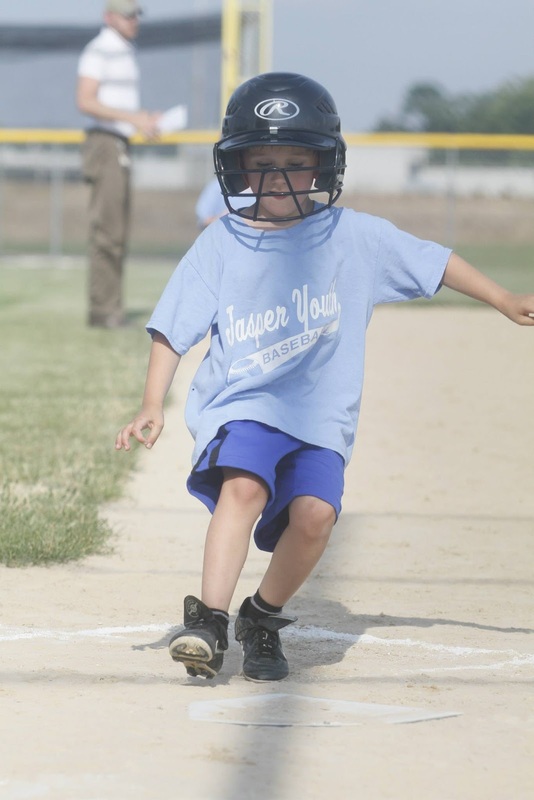 It was recently brought to my attention that my 4-year-old son was old enough to play tee-ball with the Jasper Youth Softball League. Wait? What? Really? They’ve got to be kidding. He’s spent only 48 months on this earth, and he’s old enough for an organized sport? I would later learn that “organized” in regards to 4-year old tee-ball is a generous word. However, yes, for organized tee-ball Jack was, indeed, eligible, if questionably capable. I spent a few weeks deciding whether I should sign him up. It seemed too early. By starting now, surely, he’d be worn out and washed up by 12. He’d then turn to drugs and by 16, I’d be shopping rehab facilities. Tee-ball having served as the gateway drug. However, I was also well-aware that Jack’s athletic gene-pool was probably pretty shallow, so if he wanted to play, I better give him any head start he could get. So I drank the Kool-Aid and hopped on the the ride to nowhere. I soon learned that there would be a tee-ball draft. Yep. This is a real situation. Coaches, actually get together and haggle for players, half of whom can’t even wipe their own butts, my son among them. Jack was drafted to the Devil Rays, and his first practice was scheduled. That practice. The Devil Rays looked like castaways on the island of misfit toys. And the poor well-intended coach….he handed Jack a bat - on purpose - not knowing that Jack would rather swing the bat at his teammates like a sword than try and hit the ball. 4. Picking grass out of the outfield, running it into the infield and throwing it at this teammates. The ball? Oh that probably just whizzed on by him. He’d rather lick his hat. Jack likes to hit the ball off the tee and then hurl the bat - usually the bat goes farther than the ball. He then likes to gallop, skip, or run backwards to 1st base. Even with his theatrics, he usually makes it on base courtesy of the the absurdity and hilarity of 4 year old tee-ball. It’s like the wild wild west out on that field. Balls flying, bats swinging. Kids running in all directions. No rules apply. If Jack decides he’d rather play pitcher - he goes and shoves the pitcher off the mound. If a player is running to 3rd base, and Jack doesn’t like the look of him, he blocks him like a linebacker. There are no rules in Jack’s wild wild west tee-ball show, except one: You always slide home. Running home? Slide! Going up to the plate to bat? Slide!! And why throw the ball home and make the out when you can run it in and…..Slide! We bring Jack home looking like he got bombed with dirt. But he’s really bombed on sugar. After the game comes Jack’s favorite part of playing tee-ball - a trip to the concession stand. God bless the Jasper Youth Softball Concession Stand for feeding my family dinner (and dessert!) 4 nights a week. Not surprisingly, the Devil Rays are 0-10. Which is horrible, except if you’re Jack. Win? Lose? It doesn't matter to him. That’s the best part of 4 year old tee-ball. The scoreboard, for these days, for these kids, doesn’t exist. This won’t always be true. Some day, in the near future, there will be winners, there will be losers but this summer, out on the field, all that matters is sliding home. Yes! All of its true. Tey kickball! The swarm of kids all chasing the same ball is a sight! Try*...not "tey"...wtf is tey!? Ugh spellcheck...a moms favorite pasttime. Soccer is just as much fun to watch. The ball is like a hive and all the little kids are like bees going to it. At first, we pray for your child long live. We wish he play well softball always. I spent a couple of weeks choosing whether I ought to sign him up. It appeared to be too soon. By beginning now, definitely, he'd be exhausted and cleaned up by 12. He'd then swing to drugs and by 16, I'd be shopping recovery offices. Tee-ball having served as the entryway drug. Personally, wood softball bats can not compare with composite softball bats. I prefer composite one. But wood bats for experienced players, I think. I mostly agree, but not on soccer part.